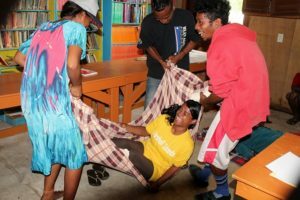 Eyes were popping and a reluctant attitude abounded as the 19 Waan Aelon in Majel (WAM) trainees were asked to do mouth-to-mouth resuscitation on one of their colleagues. 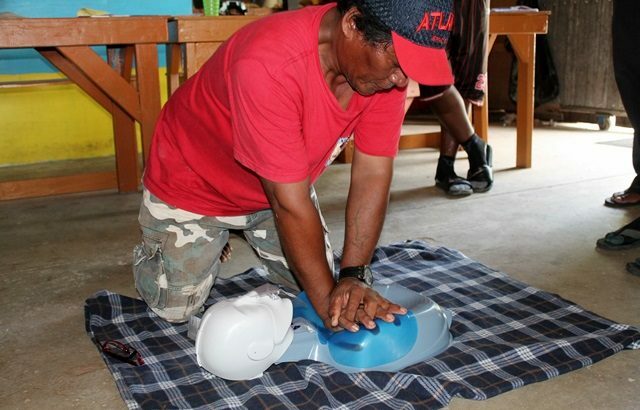 But Majuro Red Cross (MRCS) instructors were working hard to dispell this thinking during a two-day, “full on” first aid course designed to give people the hands-on skills need to save people’s lives. “This is the first time the Red Cross has done this type of training for WAM and, I believe, for any organization here. It came about after the Red Cross’ Paul Alee contacted me and said they were thinking of doing some first aid training. “I said great! What can I do to facilitate it,” said Alson, knowing that this was just exactly the sort of training that boosted the skill base for the WAM trainees. Understanding Alson’s eagerness, the MIRCS team put together a successful proposal to the RMI National Training Council for funding for the course. Two part-time Red Cross instructors, Richard Anta and Kennedy Kaneko, and First Aid Course Coordinator Harry Herming led the WAM program, which is a certificate level course. Assisting them was Telbi Jason, who is the MIRCS Administrator. The trainees learned CPR, treatment of choking, management of emergency medical conditions and general first aid skills (including treatment of muscular and bony injuries, bleeding, burns, and poisoning). 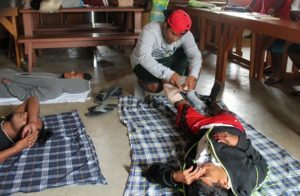 A huge benefit to WAM is that the program’s instructors also took part, so they will be certified first aid workers for ongoing programs. On the cultural side of things, Alson the instructors stressed to the trainees that it’s their obligation to put those feelings aside and do what was required. “its a difficult thing to do, but that’s part of our education on the first aid courses. “On this topic, Harry said: “For people who don’t understand, its a difficult thing (the idea of putting your mouth on your sister or mother), but once you have learned that it can really help someone and actually save their life this makes it easier. “Basically, he said, once you know why you must do something, it becomes easier. Footnote: This article and photos first appeared in the Marshall Islands Journal’s August 5, 2016 issue. 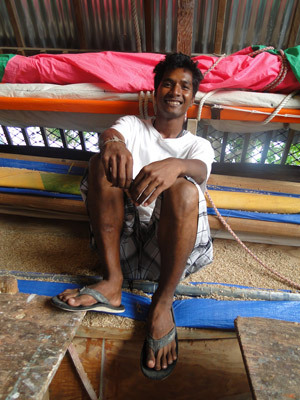 To subscribe to the Journal, check their website at www.marshallislandsjournal.com. WAM trainees have had much to be happy about in the past weeks. Counselor Tolina Tomeing helped the trainees to get birth certificates, social security numbers and ID cards. With these documents they will soon be helped to open up their own savings accounts at the Bank of Guam. All of these things will help them in their future endeavors after graduation from the program. During this initial part of the program, each trainee received a health screening courtesy of the Ministry of Health and the Wellness Center, whose staff educated them on healthy meals they can make, as well as the importance of physical activity. On Constitution Day the WAM trainees and staff enjoyed participating in the celebrations and the canoe races. To see how much fun they had with exciting video coverage go to our Facebook page. 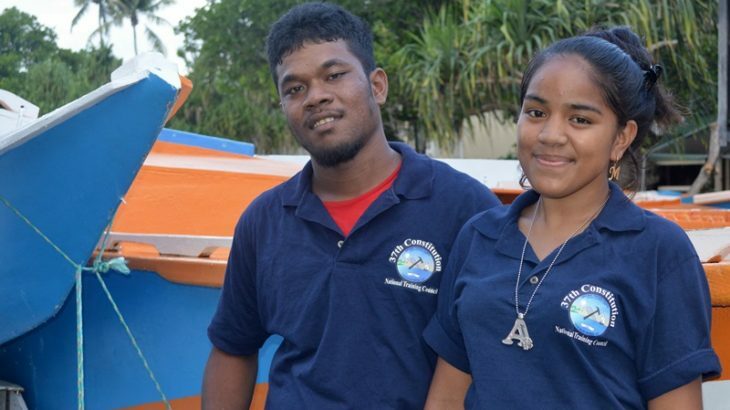 At least six Waan Aelon in Majel trainees are guaranteed jobs after they graduate on Friday, October 2, with the potential of 12 jobs being available, according to WAM Director Alson Kelen. All our welcome to attend the graduation, which will be held at 3pm on October 2 next to WAM at the MIR picnic area. The Marshallese in Taiwan, from left, are Doug Silk of MEC, Ceo John of Ebeye KAJUR, Linton Baso of WAM, Monean Anjain of AutoKwaj, and Carlwin Amlej of MWSC. Carpenter Linton Baso is being groomed to be a leader in the Waan Aelon in Majel program and is currently adding to his skills at a training workshop in Taipei, Taiwan. “We are very fortunate at WAM that we have a good partnership with the ROC. I have been on a number of excellent workshops in Taiwan, and now Linton is there doing a Level II Carpentry course,” said WAM Director Alson Kelen. 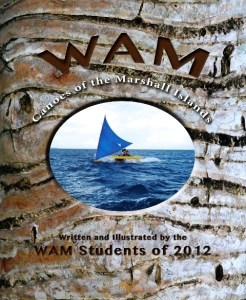 Many of the trainees in the 2012 program star in the book simply titled WAM: Canoes of the Marshall Islands, which was published thanks to the Unbound Bookmaker Project, coordinated by Jamie Zvirzdin. 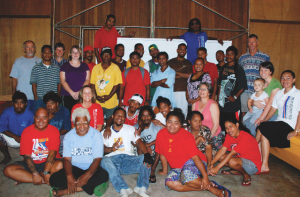 Under this project many Marshallese non-profit organizations were sponsored to create and publish books. According to the Unbound Bookmaker site the project aims to provide an authorship experience for children in the Marshall Islands to write, illustrate, and publish their own stories, in both Marshallese and English. To hear more about the project, you can listen to Jamie Zvirzdin, creator of the project, in an interview with ABC Radio Australia. To see more about the book or to buy a copy, go to the amazon store. 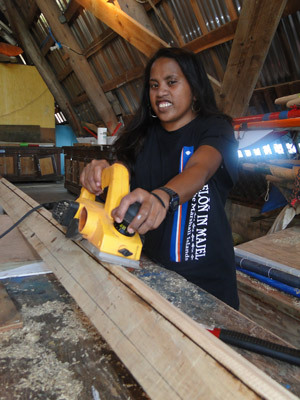 One hour and thirty-six minutes: That’s all the time that Rinkey Hersey, 24, missed over the six-month Waan Aelon in Majel (WAM) vocational training program, which ends this Friday. “That’s pretty amazing!” said Associate Director Kathy Hutton. 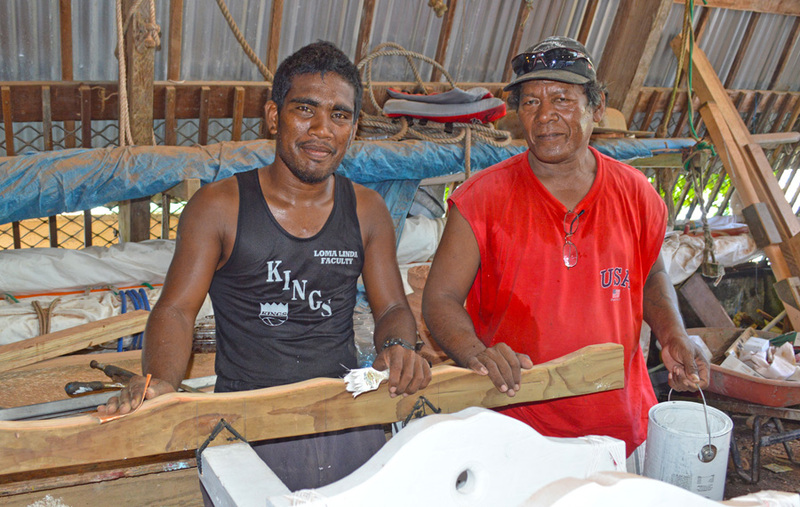 As part of teaching good work ethics, the Waan Aelon in Majel (WAM) program’s directors are extremely strict about trainees clocking in and out, which is done in clear view of management in the upstairs office. 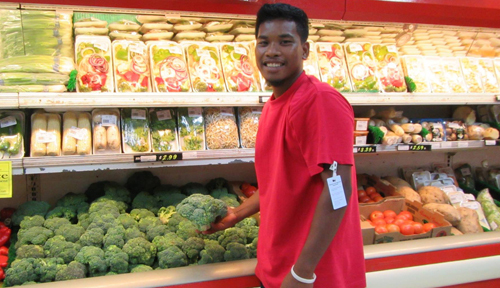 Hersey’s punctuality, and other newly-learned skills, has made the program a complete success for him as he’s one of the trainees who will graduate and move straight into a full time job. That job ran out, and he struggled to find another. “But I did do referee training with the Basketball Federation,” he said. Then, late in 2010, he saw an ad in the Journal for the WAM training program, which was to begin in January, 2011, and applied. He was successful, but funding was held up and the program didn’t start until August. “I applied because I wanted to learn how to build a canoe. I have seen how the old men and women of the Marshall Islands have been losing their traditions and their culture and I wanted to find out more about it so I can continue the traditions. 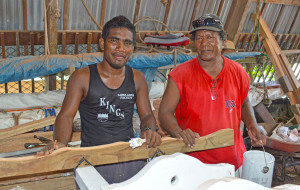 Ijikar Abraham and Ken Taggart were his carpentry instructors and one of the items Hersey has made in the program is a large clock for the hardware store Do It Best. No doubt one fact that helped Hersey have such a good time score is that he doesn’t drink alcohol. “I used to drink in high school a bit, but I haven’t had a drink now in three or four years. A few years of not doing very much went by, until she was accepted at the Juren Ae program, which is run by Internal Affairs and is a four-month training, focusing on making handicrafts and learning sewing techniques. Its program is on the Ministry of Education campus, next to WAM. “While I was at Juren Ae, I would come over to WAM and watch what they were doing and became interested. So when I heard there was a training program coming up, I applied. 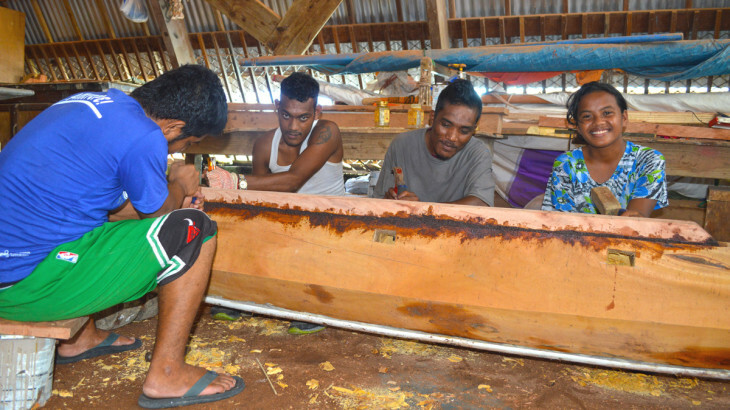 “One of my favorite things about the program is the activities, especially learning how to use the tools to build canoes. I also loved the English and Math stuff and the counseling part.” The latter is counseling on both a group and individual basis, which is run by Cece Kilma and Tolina Tomeing. They also work for WAM’s Employer Assistance Program, which is funded by the US-funded Single Stage Agency through its Substance Abuse Prevention and Treatment program. When Sakura graduates, she hopes to find a job, “so I can make some money so I can afford to go back to school and finish my GED and then go on to college.